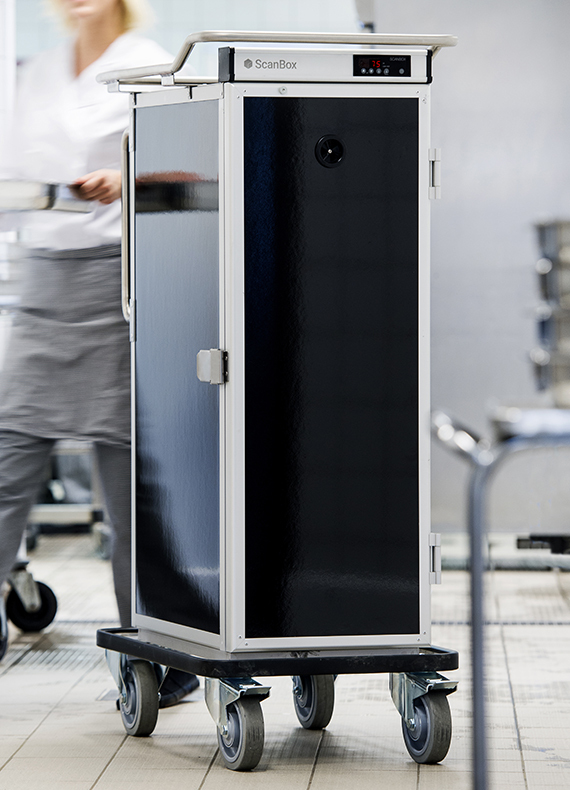 The ScanBox food transport carts are elegant, versa­tile and lightweight. Some of them are in fact half the weight of comparable competing products. They are nevertheless designed for “heavy duty”. All our carts, including the high capacity Duo varieties, are very easy to operate and transport. Our long experience from working with customers supplying e.g. schools and senior care centres has brought us a profound under­standing of the need for a box design that is both ro­bust and ergonomic. Due to a design with anodized aluminium on the inside and plastic laminate reinforced by fibreglass on the outside, our transport boxes have excellent impact re­sistance. The 30 mm insulation holds the temperature over extended periods and the solid, stainless steel chassis has robust and easy-rolling 160 mm castors as standard. As a protection in case of collision, the solid chassis of the cart has a plastic-covered bumper all around it. The stainless steel top rail protects the box, serves as a tow handle and facilitates loading on top – e.g. of crockery and dry goods. The push/pull handles on the back of the cart ensure the operator an ergonomical­ly correct working position during handling. A digital display for temperature setting is used for all our box­es. It also indicates when the selected temperature is reached. For your comfort, the display is found at eye level – another proof of our ergonomic thinking. Along with replaceable seals, detachable racks on the inside make the boxes very easy to clean. With air cir­culating freely between runners, we ensure a uniform temperature throughout the compartment. This is how our boxes preserve the best possible food quality. Due to detacha­ble racks the air is allowed to circulate freely throughout the compartment. This ensures a perfect, uniform temperature and facilitates cleaning. The top rail provides additional loading space and makes the cart easy to operate. An ergonomically well-placed display, offers full control and easy tem­perature setting. It also indicates when the selected temperature has been reached. 160 mm castors make the cart easy to operate. Ergonomic push/pull handles on the back ensure easy and safe transports. The innovative ScanBox design and the combination of an aluminium profile system and a sandwich of plastic, insulation and aluminium material offers many advantag­es in comparison with traditional boxes used for cold/ hot holding of food. For us, it is all about preserving the food quality. Aluminium transfers cold and heat efficiently. It is also a lightweight material reducing the total weight of boxes considerably. Only very little energy is required when heating and cooling aluminium and the material is com­pletely recyclable. Therefore it also offers sustainable solutions. 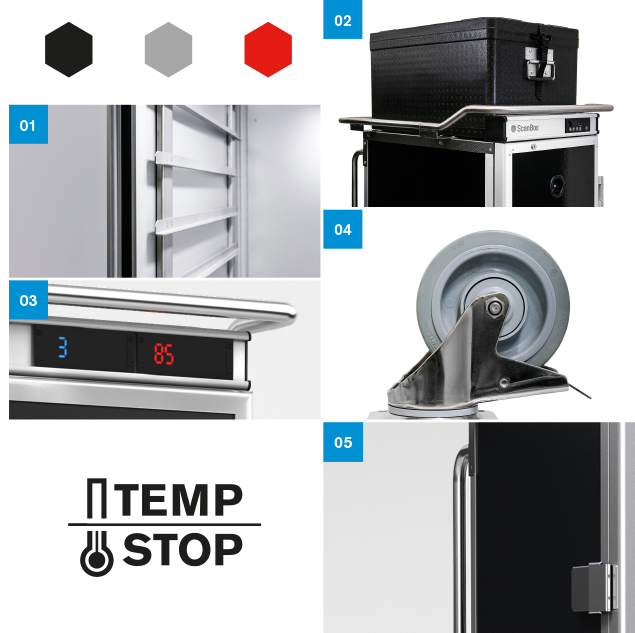 To minimize leakage of hot and cold air from the com­partment, we have developed an innovation called the Temp Stop system. By inserting a thermal bridge in the profile system, the heat/cold is kept in place. This is the secret behind our impressive insulation data.